Have you ever walked into a brand new place and immediately felt at home? That’s how we felt when we arrived at Thomas Grill Garden in Cusco, Peru. When I first began planning our trip to Cusco, I wasn’t quite sure where to start when it came to figuring out where to stay. Luckily our friend Gemma from Two Scots Abroad recommended Thomas Grill Garden, and I’m so glad she did. It’s in a great location, only blocks away from the city center, with lots of places to eat nearby. When you first walk in there is a garden area with tables and chairs which is perfect for lounging around. There are also areas to hang out inside the main communal area which has a couch, tables, and a computer, and also a lounging area on the second floor with more couches, a small kitchen area, and a TV. And when it comes to rooms, you can stay in a room with 4 beds and shared bathroom or you can get a private room/bathroom. I highly recommend the private room on the 3rd floor; the “mountain view” room. You have to take some cool stairs to get up there, it’s got two double-sized beds, and plenty of space for your bags. The bathroom was a bit small, but nothing we couldn’t handle. It was clean and the water was HOT!! And unlike some places that turn off the hot water after a certain time, TGG has hot water 24/7. But you want to know the best thing about our room? The view! We could see all of Cusco, and the view was impressive both during the day and at night. – There’s wifi on each floor and it’s the best speed we found while in Cusco. – A yummy breakfast is included. – Jenny. That’s right, Jenny. She is the sweetest person ever and I would recommend staying at TGG just so you could meet her. She went above and beyond during our stay. She helped us find a tour guide for a last minute day trip, she called and arranged for a taxi to pick us up early in the morning for our train ride to Machu Picchu, she brought us up a heater for our room (Cusco gets cold at night! ), and she even brought us coca leaf tea to help us adjust to the elevation. I would definitely recommend Thomas Grill Garden to anyone planning a stay in Cusco. We felt right at home as soon as we walked in and were sad to leave. Thanks again to Gemma for recommending TGG and of course Jenny for being such a darling and awesome hostess. Jenny is such a wee babe! I remember those stairs fondly… Great day and night shots! Nice photos and looks like a very homely place with a lovely view. I’ll be sure to check them out when I make it to Cusco. That’s great Natasha! You’ll love it! That view!! What a beautiful scene to wake up to in the morning. It sounds like this is a great base and with a lovely garden too. How was the coca leaf tea? Thanks for taking a photo of those stairs. How cool! Wonder how they decided to make them like that! Great colors throughout the place too, and the outdoor seating looks like an amazing place to relax. Good to know the wi-fi was good for you there. That’s always one of our top requirements. Uh may, this does look cosy indeed. I have never been to Peru, yet, but will look this place up when I do. Thank you for sharing! Looks like a great place – and good timing. I’m headed to Cusco myself very soon. Thanks for the great review. Great Jennifer! You’ll love it! I love arriving at a place that instantly feels comfortable and welcoming. You’ve done a great job conveying that feeling in your photos and article. Thanks so much Sue! It definitely was a great place to stay. It’s not my ususal type of accomodation but the views alone make it worth it! Hi Ana! Yes, the views were amazing. A perfect thing to go to sleep to and wake up to. The place looks absolutely homey! I like it so much 🙂 Peru is a lovely country so it’s no wonder that they have interesting accommodations like this. I look forward to being in this country soon! Love the view! Those stairs sure are funky! When the boys get big enough for hiking we will be heading to Peru! That place looks charming, to say the least! The comfort level you feel in a place makes a big difference on how much you enjoy and explore freely. Thanks for sharing. Is Cusco the best town from which to take on Machu Picchuand no other?Then I will also take your recommendation! 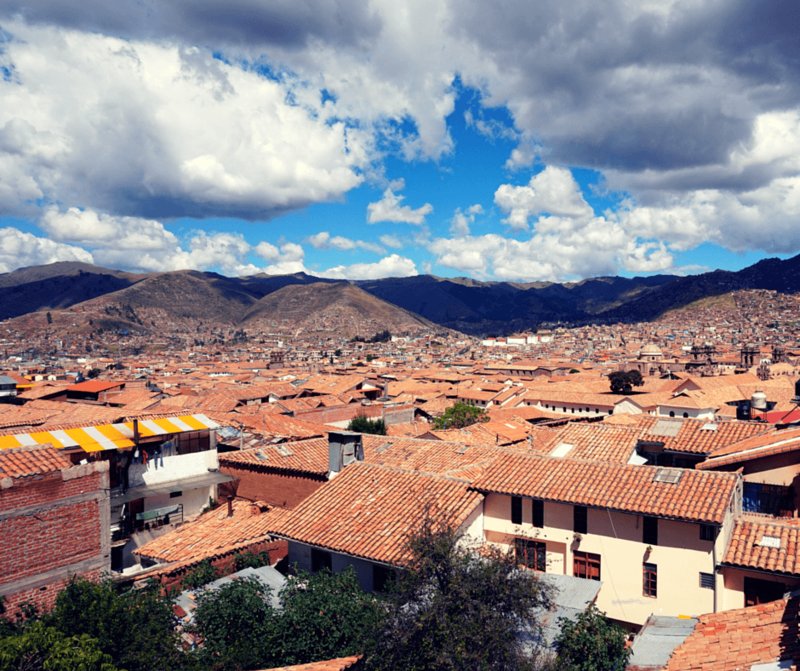 Yes, Cusco is the best unless you plan on hiking the whole way. If not, the train from Cusco is the best option. Great view! I will keep them in mind if I happen to go to Cusco.